Make sure that a pen is always handy for your customers with Secure-A-Pen's unique design. 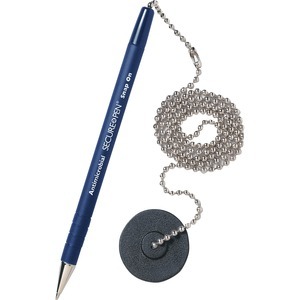 This blue ink pen features a pullout 24" chain that adheres to the round, double-coated adhesive base. The adhesive base will adhere to most clean, flat surfaces. When ink runs dry, simply unhook the pen from the base and add a replacement pen. The medium point pen also features a rubberized grip and ridges for writing comfort. Antimicrobial pen features EPA and FDA approved technology to prevent bacterial and fungal growth. Swivel socket and pen holder are chrome-plated metal. Replacement pens are sold separately.